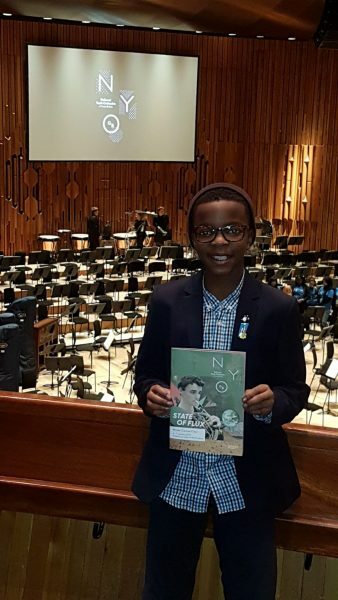 We’re featuring a write-up one of our talented young musicians submitted after he attended a National Youth Orchestra of Great Britain concert in early January. Nathan plays drums and guitar and is in several of our Academy ensembles including Newham Music Collective, Newham Youth Jazz Collective, and Academy Guitars. He has been a London Music Fund Scholar since 2016. On Saturday (5/1/19) I had the opportunity to watch National Youth Orchestra (NYO) of Great Britain, perform at the Barbican. My mum and I got to sit at the angle where we could see everyone and every instrument. We knew this was going to be good. The first piece they played was called Science Fiction and was mainly played with percussion (see picture). It was alien themed and above them, was a screen where we could watch the aliens try to destroy the planet while they played music alongside it. Did you know that 1951 films such as ‘The Day the Earth Stood Still’ and other alien movies had the theme tune of Doctor Who? This was one of the facts I found out from the programme/guide. It was enjoyable and exciting. There were so many percussion instruments. Many of the percussion sounds were creative and unusual, very interesting and fun to watch. As some of the instruments looked like golden bird cages using sticks (that looked like violinists’ bows) to brush against them. Some of the piece involved clapping and stamping their feet to make rumbles and quick sounds. The second piece was called Doctor Atomic Symphony. This piece was created after sci-fi films and comics. It was through radioactive accidents that both Spider-man and Hulk got their powers. The third and final piece was called Symphony NO.2. My mother and I thought that it sounded like a mix of a Disney film, a Tom and Jerry episode with some bumble bees. This was because it was soft and peaceful and at certain times sounded like a chase. Watching the conductor, Kirill Karabits, was entertaining because he was so enthusiastic. NYO played as well as professionals. This inspires me to be creative and encourages me to try and play like them, at my very best.